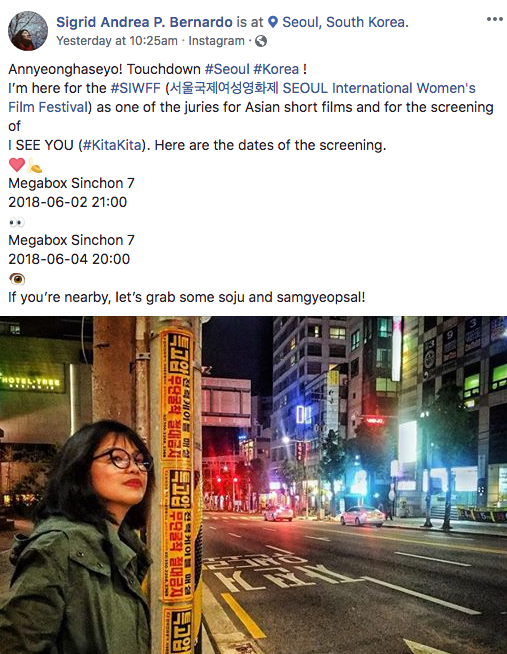 World renowned Filipina film director Sigrid Bernardo is here in Seoul for the Seoul International Woman Film Festival 2018 with her blockbuster movie, "Kita Kita". We cordially invite Filipinos in South Korea on June 4, 2018 8:00PM on Megabox Shinchon 7 (Near Shinchon Station Line 2) or its final screening. Q&A will follow after showing the film. Shot in Sapporo Japan, "Kita Kita" is a story about a Filipina who lost her vision after her engagement with her Japanese boyfriend fell apart. The romantic comedy starring the odd pairing of Empoy Marquez and Alessandra de Rossi crossed the P300-million mark after three weeks in the Philippines.